We just wanted to say a huge thank you to Contact Carpet Cleaning for their sterling work in our high footfall photography studio. The guys were absolutely brilliant from start to finish. The customer service has been excellent and we couldn’t be happier with the results. They agreed to come to our studio at a convenient time so that business was not affected in the slightest. We were also very happy with the costs incurred and thought that the prices represented great value. There is no doubt that we will continue to use Contact Carpet Cleaning in the future and would highly recommend their services to any businesses. Thanks again for a fantastic service. Dom from Contact Carpet Cleaning recently spent some time in our home to clean and seal the Amtico flooring in our kitchen and hallway. Dom was knowledgeable and courteous whilst he was in our home - clearly, he fully understands this type of flooring and was extremely thorough and professional in the work he carried out. The finished result was brilliant and it looked as pristine as the day it was originally laid. If you have Amtico or Karndean flooring, I would definitely recommend that you give Dom a call - you won't regret it! Dom came round to clean my leather sofa and to say it looks brand new is an under statement. Dom did some research prior to cleaning the sofa due to the issues I had. Very professional and efficient service. Definitely recommend. Dom cleaned my lounge and bedroom carpets. He told me what all the stains were, he has a stain remover for everything. He is amazing at what he does. I can't recommend his enough. Dom did an excellent job with my living room, bedroom and stairs beige carpets. His service was professional and knowledgeable. My carpets have never looked as good since they were new. Thanks Dom - until next time. Totally recommend - you wont be disappointed. I had the carpets cleaned before moving into a new house. Dom was able to quote on the basis of room sizes and I found him to be an extremely knowledgeable and helpful in every respect from quote to completion. On the day Dom shared details of how he would tackle each stain and the expected outcome. To say he knows his stuff is a complete understatement. In terms of stain removal, Dom exceeded my expectations. I can now delay plans to replace the carpets but when asked he also offered his unbiased knowledge on carpet vendors and choices. It's obvious that Dom is a thoroughly decent and honest guy who does a fantastic job at cleaning carpets. I would have no hesitation in recommending him for any carpet cleaning job and I would certainly use him again. 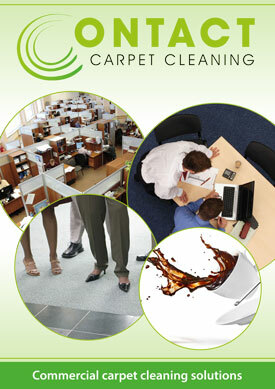 I recently had 2 carpets cleaned by Contact Carpets. Dom fitted me in at short notice. The results were great. All stains disappeared. I would have no hesitation in recommending him and will definitely use him in the future. From the moment he arrived to price the job, Dominic's enthusiasm for his work was evident. He arrived when he said he would and was soon hard at work. His equipment is top notch and produces an excellent finish. His pride in his work allows no stain to remain unremoved. All at a reasonable price, I would recommend Dominic to any of my friends. Had my lounge and stair carpets cleaned and am very happy with the results. Dom was very friendly and explained what he would be doing and even left a leaflet telling me how to treat any future accidents. He was also honest enough to reduce the price upon arrival when he checked the room measurements I’d given him too. Now that was a breath of fresh air as I don’t think most people would have bothered. It’s an old carpet I have but the stains have come out and the pile has been lifted too. We've used Contact Carpet Cleaning twice now, to clean carpets in a rental property. We were beyond happy with the results & have already asked Contact to come to our new house to freshen up some carpets here. Thank you for your fantastic service. Establish minimum standards of workmanship. Ensure members are fully trained, insured and work to the organisation's code of practice. Provide a consumer advisory service. Please click here to view the NCCA video. Trust Mark is the Government endorsed quality mark, not-for-profit organisation to help consumers find reliable and trustworthy local tradesmen. Working to Government endorsed standards. Technical skills and quality of work. Please click here to view our Terms and Conditions of Business.